I totally threw you off with that title, didn’t I? Hahaha…I’m so crafty. Literally. So…I’ll admit that I’m pretty new to traditional quilting. But here is one I just made with pretty good success I think…what do you say? I call it “Raspberry Truffle”…because each of my creations deserves to be named. Most of the fabrics are from the Joel Dewberry Modern Meadow line, although there are a few others (Patty Young and Alexander Henry I think, correct me if I’m wrong…the names escape me right now.) 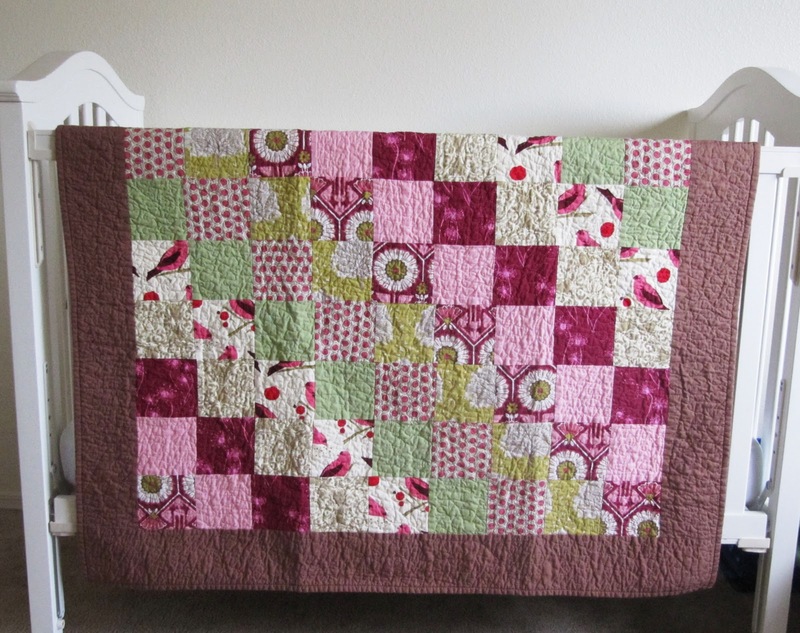 A customer chose the fabrics from my “Pink Brown Raspberry Lime” Listing in my shop. The quilt top came together super fast, only took me about an hour and a half or so. It’s a very simple design though. Then I basted it by taping the backing to the floor, pulled taught. I laid the batting out over top and rolled it up. Then, using spray baste, I sprayed little ‘row’ sections and would slowly unroll the batting, smoothing it out like applying wallpaper as I went. I did the same thing with the quilt top. Easy Peasy and very secure. Took me about a half hour…or the exact time that “Curious George” starts and ends. That monkey is so freakin’ cute. Binding was the easiest thing ever. 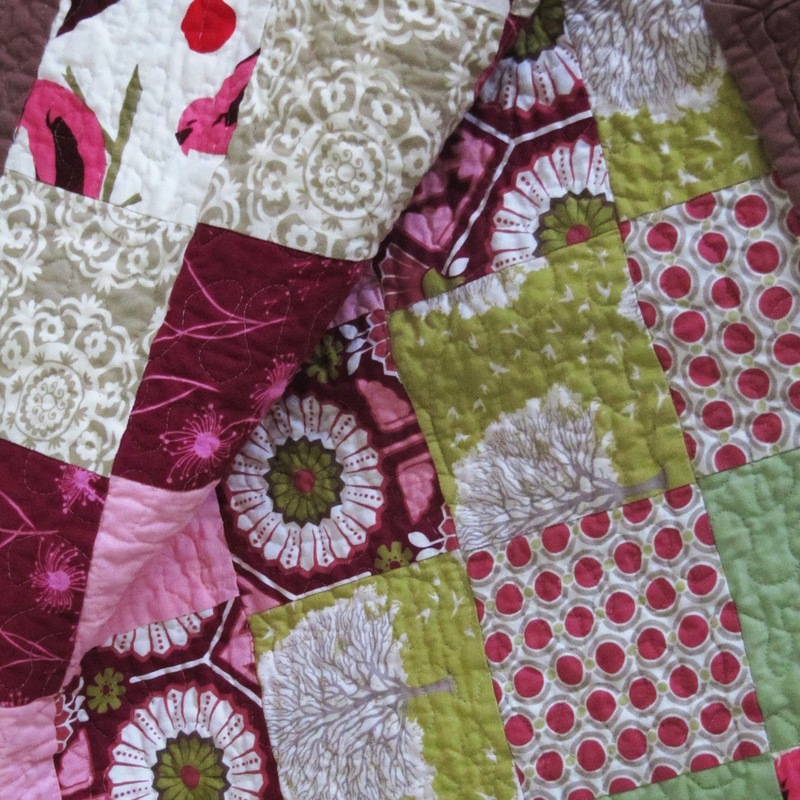 Binding a traditional quilt is 1,000,000,000 times easier than binding a puff quilt. I can’t even express to you how great it was to just whip on the binding and not have to spend forever S-L-O-W-L-Y guiding the machine and the fabric so it stitches on just right. I was very proud of my binding. Wash. Dry. Done. Love it! 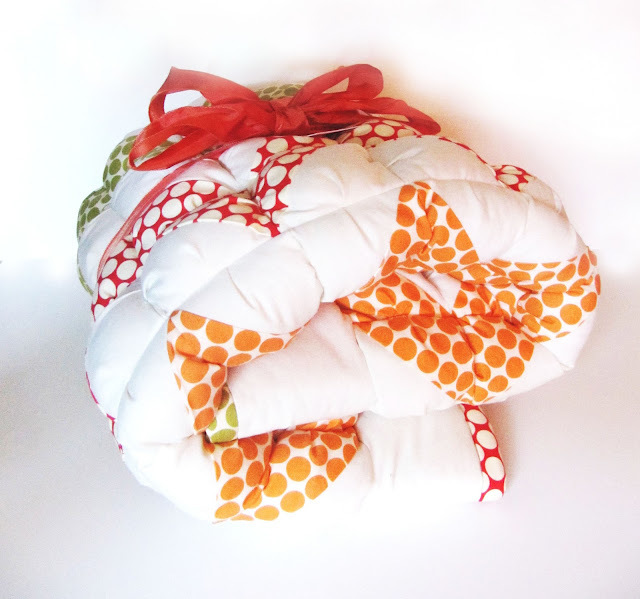 Now to ship it off to the lucky girl that gets to snuggle with this surprisingly warm quilt. I hope she will cherish it forever. I gave this quilt away in place of the Hard Candy quilt since I’m not going to sell that one (buttons are kind of a liability with babies. Why didn’t I think of that before I made it?!!) But rest assured, my next baby will have his or her own Ziggy to snuggle with. I think if I have a girl next I’ll sub in a pink polka dot for the red. You really appreciate the color pink when you have two boys. I love this! It came out really pretty. Can you e-mail me the pattern you used? What a beautiful quilt! Love the fabric combination. Great job! 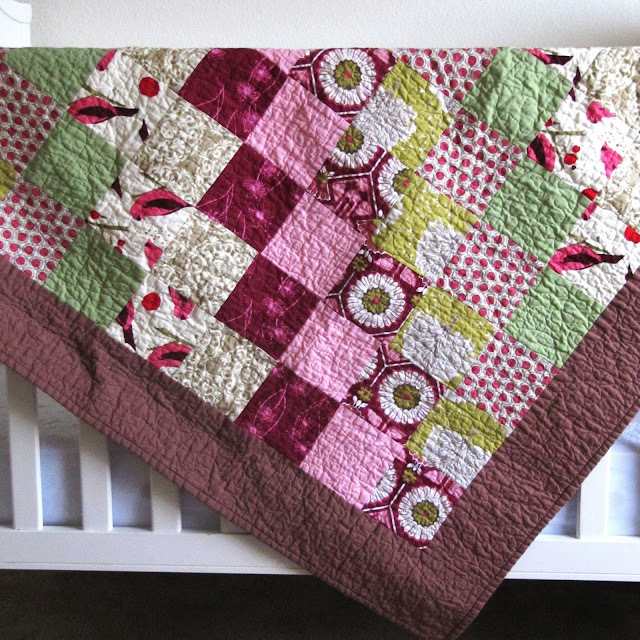 It is a Beautiful quilt! I love it! the colors are perfect. 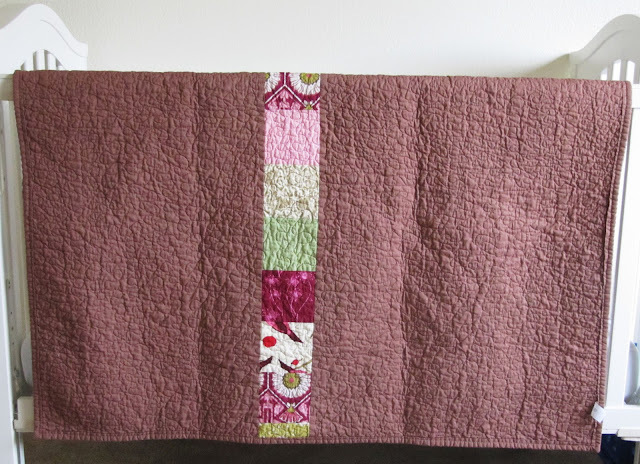 I am just starting to do quilting. I hope I can make something this good someday. Gorgeous! I love how it all came together. It's my hubcap's birthday today, too! He's in grad school, so he commutes to class straight from work. I probably won't see him until around 10pm. He has class again tomorrow, but I'm going to meet him so we can paint the town Indian. The Ziggy was my FAVORITE! Like, all-time favorite. For real. I love the Raspberry truffle though! I'd like to see a tutorial or something, if you could. I was thoroughly confused by the basting and spray and all that jazz. I just bought an AccuQuilt Go! Cutter and have no idea what to do! Oh my gosh! I ADORE the Raspberry Truffle quilt. It is just beautiful. Great job. Tell hubby Happy Birthday from me. Today is my hubby's birthday too.